'A Dangerous Meeting' (Mercyful Fate), 'Metal on Metal' (Anvil), 'The Frayed Ends of Sanity' (Metallica), 'At Dawn They Sleep' (Slayer), 'Not Fragile' (BTO), 'On Fire' (Van Halen), 'Pounding Metal' (Exciter), 'Destroyer' (Twisted Sister), 'Psychotherapy' (the Ramones) and 'Snap Your Fingers, Snap Your Neck' (Prong) is the track list for Six Feet Under's third edition of covers, dubbed 'Graveyard Classics 3,' out Jan. 19 via longtime label Metal Blade Records. 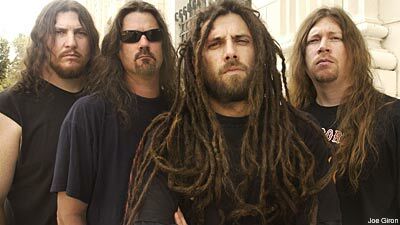 We asked dreadlocked, guttural growler Chris Barnes to break down the level of ease and difficulty of translating these songs into Six Feet Under'ese. Favorite? "It's not politically correct to have a favorite. I like them all. All except one or two I picked myself. They all have different vibes from separate and interesting types of bands. Each song has been done by a cool band and they stuck out to me. They have certain feeling. I like the Slayer, the Fate, the Metallica ... they are all cool." Which song turned out better than expected? "The BTO song was surprising. [Guitarist] Steve [Swanson] laid down a killer, bluesy lead, encompassing the whole song. It had a cool tone." Most surprisingly easy song to cover? "What we thought was gonna be the hardest but that surprisingly came together quickly was the Van Halen song. I know Steve is an awesome guitarist, but he is not noted for being a good guitarist, but I thought it would be hard to pull off, being a crazy Halen song and well, it's Eddie Van Halen. But that one just really was such a complex song, and those guys nailed it"
Hardest to cover? "The Metallica song. Certain parts in the original mix, in the lead section and in the rhythm section ... it was hard to figure out some of those parts, but the guys researched the songs and concentrated on playing the songs right and their parts right. They were perfectly played. We even approached Hank from Mercyful Fate for some tabs on 'A Dangerous Meeting,' too. We worked hard to pay tribute to killer songs." What song will Howard Stern play this time, since Stern staffer and death metal maven Richard Christy helped get previous graveyard classics played on the air? "I don't think of him that much, and I am sure he doesn't think about me. I didn't even know Howard was on the air still, so I was blown away. He reminds me of Andrew Dice Clay, like someone who is super dated. I like what we do so I don't put much concern into what others think. I wouldn't be doing this for as long as I have if I did. There is negative criticism since day one. From the beginning days when I was in Cannibal Corpse, critics said that the music was the worst thing on earth, but those same critics now say they still do their thing and we're doing our thing and that our oldest stuff was the best stuff ever done in death metal! It's laughable. If you are a garbage man or a senator, be happy and do your thing! We're lucky to do that."